Brit Shalom is a naming ceremony for Jewish families opting out of circumcision. It is not intended for boys who have previously been circumcised in a hospital. Brit Shalom can be similar to the naming ceremony traditionally used for baby girls, sometimes called Brit Bat (daughter). 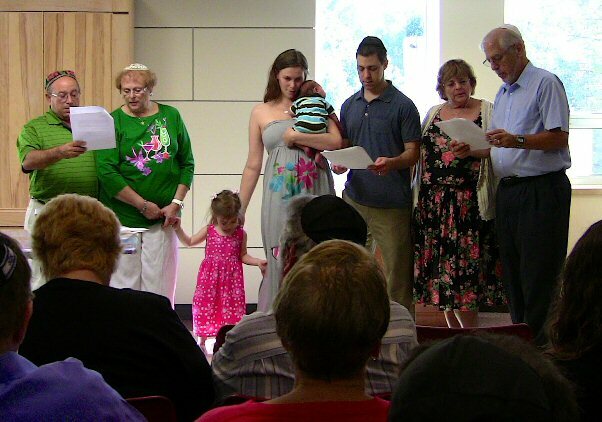 Other names for Brit Shalom include Brit Ben (son), Brit Rechitzah (covenant with foot-washing), Alternative Brit (or Bris) Naming Ceremony, Brit HaLev (covenant of the heart), Brit B'li Milah (covenant without cutting) and Brit Chayim (covenant of life). The ceremony may be performed by a Rabbi, Cantor, or experienced lay leader. Families may also create or adapt their own ceremony from existing samples or templates. Speech: "American Circumcision and Brit Milah in 2003"
Contact Mark D. Reiss, MD.